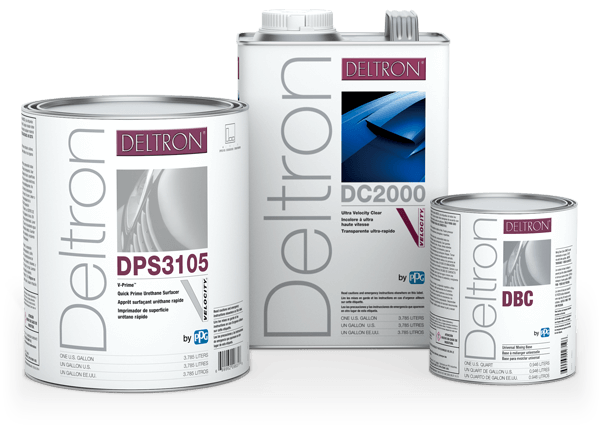 Highly regarded by paint technicians for its ease of use and recoatability, the Deltron® refinish system is easily adaptable to a wide range of application conditions and painter skill levels. In shops of all shapes and sizes, the Deltron® system offers a track record of color excellence and process efficiency. The Deltron® system offers an excellent choice of productive-minded undercoats featuring excellent corrosion resistance and quick dry-to-sand times, such as DPS305x V-Prime® and DPS3105 V-Prime® Quick Prime urethane surfacers. Color matching excellence, hence avoidance of redo’s, coupled with a fast air dry time of 15 minutes contribute to this basecoat’s impressive productivity. A premium quality, single-stage, two-component refinish product designed to offer exceptional gloss and color match. Interior and underhood colors direct from the Deltron® mixing system. The Deltron® lineup of Ultra and High Velocity Clearcoats offers superfast air dry time, in as little as one hour. Compatible with Deltron® topcoats and clears, the Vibrance Collection® brand of hot colors, unique micas, innovative pigments and special effects offers custom builders and enthusiasts an unlimited array of custom finish choices to bring their visions to life. Suitable for both air dry and bake conditions, the Deltron® product lineup offers the capability to tailor a refinish system to match your shop’s operating demands and performance needs. Ideal for collision centers seeking a system with a wide range of applications, including spot and panel repairs or large, multi-panel/all-over jobs. Ideal for collision centers seeking an easy-to-use performance system of proven products offering the durability and adaptability to various application areas. Ideal for collision centers seeking a system with fast air-dry times for spot and panel repairs. Ideal for all collision centers needing a quality, economical system when a single-stage finish is preferred over basecoat/clearcoat. PPG's Deltron® Speed Prime Repair System for Minor Damage offers an economical repair alternative for scratches, dings and small dents, as well as dimples resulting from hailstorms.